While older children might be able to read the FOCUS Progressive Muscle Relaxation script on their own, others may need to follow along while it is read to them. 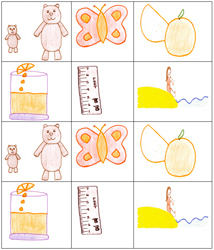 It can be helpful for younger children to have a visual aid, in the form of pictures of each part of the story. We developed the Progressive Muscle Relaxation Picture keychain to provide a visual reference for each of the scenarios in the script. The key chain is portable and can be used as a reminder of the important relaxation steps that a child can use when he or she is nervous. To make the keychain, you will need a key or binder ring, hole punch and pictures. You can print the pictures that are included here or your children can draw their own. Simply cut out the pictures, punch holes and attach to the key ring. Your children can easily carry it in a backpack or pocket. The keychain will help them remember the steps when they need to relax. As a mom and military spouse, I know that the holiday season can be full of hustle and bustle and lots of stress. I can remember two years ago when I volunteered to help out with the holiday performance for my daughter’s Kindergarten class. I found myself in a room filled with 45 “little reindeers” looking at me like they were going to cry or throw up. I had very little time to respond as they were getting ready to go on stage. Knowing in my head that their tummies were probably filled with butterflies and their hands were shaking, I gathered them all together. I towered over them like a big Christmas tree and told them in a very soft and “mommy friendly” voice, “boys and girls I want you to listen to my voice very carefully.” I proceeded to teach them how to relax using the FOCUS Progressive Muscle Relaxation script. I was amazed at how relaxed each and every one of them became. They had a wonderful performance, and I was so proud of all of them. This is now a ritual my kids use before many performances, tests, meetings, sports events, and much more. I hope that you will find this relaxation technique and keychain as helpful as I have throughout the holiday season and all year long.